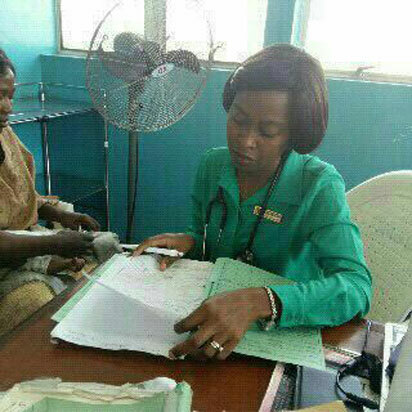 Security operatives are battling to unravel the mystery behind the death of Consultant pediatrician at the Lagos University Teaching Hospital (LUTH), Dr. Hestia Idiodi-Thomas who died recently after sustaining injuries at home. The operatives are trying to establish whether the young doctor was killed as a result of domestic violence or she committed suicide. The family of the deceased have, however, declared their son-in-law as innocent. According to Vanguard, sources at LUTH alleged that the mother of two had a history of depression but the state in which she was when she was received at the hospital on October 14 showed she could have been a victim of violence. “The husband told us she had a history of depression and suicidal attempts. I heard that she jumped off the second floor. I spoke with some of her colleagues, it seems it’s a case of suicide. The family of the deceased has maintained that their in-law, who was like a son to them, was not responsible for their daughter’s death. The mother of the deceased was said to have pleaded with some of the members of NMA , who visited her home, not to abandon her son in-law,” a source told Sunday Vanguard. The mother of the deceased was said to have wondered why someone will be as insensitive and wicked as to conclude that her son-in-law killed her daughter. “She cursed those who started the killing rumour because it only added to her pain which was already unbearable. The mother, who claimed to be a principal officer in a university and has some background in psychology, claimed she knows the tell tale signs of domestic violence. Also shocked by media reports alleging that the husband might have killed his wife, the Lagos State branch of NMA condemned the linkage of the death of the deceased to the husband. The NMA, through its Public Relations Officer, Dr Ibrahim Ogunbi, wondered why some journalists should carry stories of such sensitive matter without proper investigations. “We in the NMA are not happy with what is reported in the social media and the national dailies,” Ogunbi said. Dr. Tope Ojo, Lagos NMA Chairman, also described the case as a sensitive issue that should be treated with caution. In his reaction to an alleged withdrawal of the case from the police by the family of the deceased, Ojo said the NMA was not aware of the development, which he said would be strange. However, he noted that the case was beyond the family because it is now a coroner case. “Whether they want it or not, it does not matter. Their view does not count at this level. It is now a coroner inquest. For now, there is no litigation,” the NMA boss said. He called for speedy completion of the coroner inquest, noting that part of the things delaying the report is that there may be need for forensic expert who will link the autopsy to the environment where the incident took place.